It is equally possible to create a separate section with the Suppliers' register. In this way, only the total of the Suppliers' group is visible in the Chart of accounts and in the register all the individual Suppliers' accounts are being displayed. The Suppliers' accounts that are needed (see Adding a new account). The account numbering can be freely chosen. The total Suppliers will be totalized in the summary groupe 200A of the Gr column. 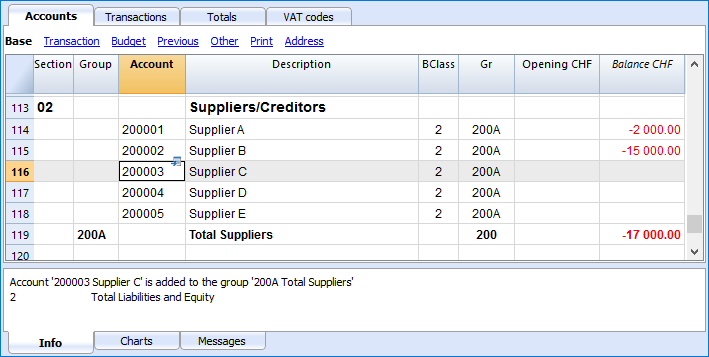 The same code or number used for the Gr (200A), must be used in the Liabilities Group column, in the row corresponding to the Total Suppliers. The groups numbering can be freely chosen (see Groups). 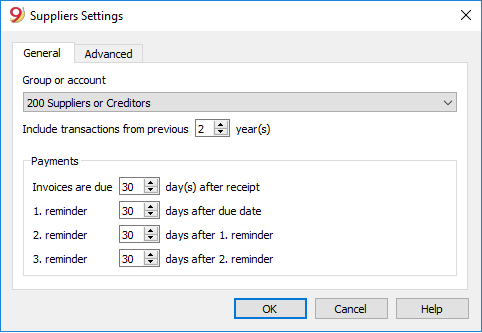 In case you don't want Suppliers to be visible on the Balance Sheet (for example, for transactions with VAT on cash received), Suppliers accounts can be created by using the Cost centers (CC3). This process is similar to the Clients cost centers. An Address view where the added columns are visible. The columns that allow to insert the address data and other information. To display one or more of these columns, use the Columns setup command from the Data menu, also in the other views. To create other views with only certain columns, use the Views setup command. Select the Accounts table, Address view and add the desired information to the Suppliers accounts. Please indicate in "Group or account", the group of the Chart of accounts in which the different Suppliers' accounts are grouped.